Synology NAS provides an easy and convenient way of storing large data with redundancy when combined with RAID. Installing and running Syncrify Server on Synology is, therefore, a natural fit. This blog talks about how to install and run Syncrify on a Synology NAS. This document assumes you have working knowledge of Linux operating system, such as connecting to a remote machine using SSH. Before installing Syncrify, you need to install Java JRE. 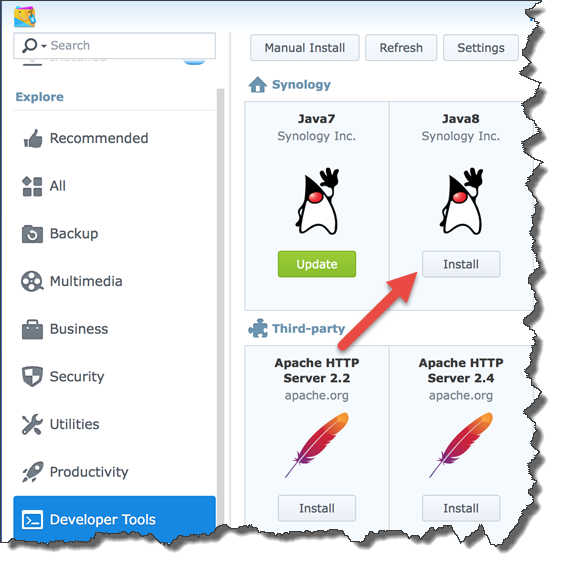 Following steps demonstrate how to install Java JRE on Synology. Connect to Synology DSM using a browser from your Windows or MAC computer. Install Java 8 - Do NOT install Java 9, Syncrify is not certified to run on Java 9 yet. See image below. You will need to access Synology via SSH or Telnet. Obviously, SSH is preferred because it is secure. Use the following steps to enable SSH. First, elevate your login to root using the following command. Note: If you get an error complaining "sudo" is an invalid command, try using "root" instead of "admin" when establishing SSH connection. The password for "root" and "admin" should be same on Synology. The contents of launchAtBoot.sh are displayed below. Lines highlighted in yellow have been updated to match the environment. Other than that, there is no difference between launchAtBoot.sh and run.sh. First, we change the current directory to the location where Syncrify is installed. Second, we specify the absolute path for java binary. These changes allow us to run the script from any location. This should display the path where java is installed, which should be used for the second (yellow) line above. Since java and the installation folder is not in System path, following changes in AppConfig.xml file are required to restart Syncrify from its web interface. Locate AppConfig.xml file in /volume1/opt/Syncrify/config folder. This file is in XML format containing several parameters. Two parameters need to be modified: jvmPath and ntServiceCommand. The parameter lines should appear like following after modification. Syncrify needs a temporary location on the disk to perform several tasks. The default location for this TEMP folder is /tmp on Synology. This location is not big enough, particularly if you plan to backup large files. Therefore, it is strongly recommended that you modify the path where temporary files are stored. For this example, we will use /volume1/opt/SyncrifyTemp folder. Following steps demonstrate how to modify the TEMP folder in Syncrify. This method only works if you are using DSM 6.0. Consider upgrading your Synology if you are using an older build. 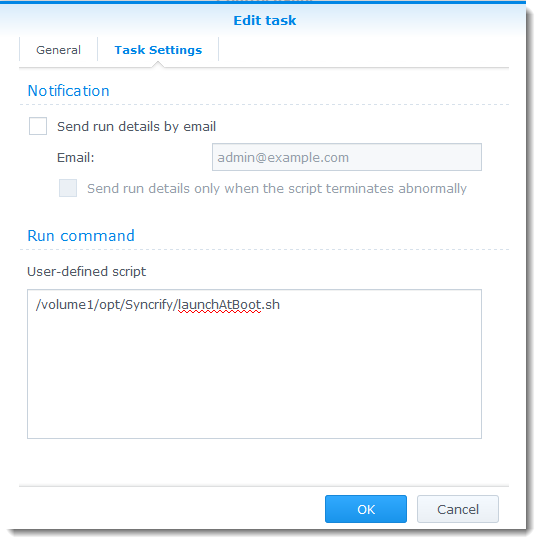 Starting from version 6.0, Synology DSM contains an ability to run scripts at boot time. Using this wizard, you can execute launchAtBoot.sh when your NAS device reboots. Synology uses upstart daemon to execute programs at boot time. This requires a script in /etc/init. Let call this script syncrify.conf. It should have the following contents. To start Syncrify, type the following at the prompt. Finally, try opening http://YourSynologyNas:5800 from a browser on your desktop computer to access its web interface. An important tool in troubleshooting any problem is to see the log file, which is located in /var/log/upstart/syncrify.log . Messages printed to standard output go this file and comes handy if you run into problems.